Webcam in the Forest: Now with sound! We have installed new webcam equipment at Buenaventura in Ecuador and as promised we are now broadcasting the Webcam in the Forest live with sound. We invite you all to listen to some of the over 30 different species of bird that live in the reserve. For the next few days we will be tweaking the setup a little so there may be a few teething problems, but we will try to keep downtime and disruptions to a minimum. To give you an idea of what’s going on “behind the lens” we can tell you that as of yesterday we have changed from recording with an Axis 211w to using a Varifocal waterproof camera (4mm-9mm) attached to shade/weather housing hooked up to a reinforced, moisture proof desktop computer with a Offsprey video card and a standard directional microphone for the sound. To transmit the video from the Ecuadorian cloud forest direct to over 1000 computers around the world we use a satellite internet connection to get it out and then a streaming server in the UK supplied by Finetra for distribution. The red bird feeder that the hummingbirds visit is filled with approximately 1 liter of water mixed with one cup of sugar and amazingly the birds can drink over 2 liters a day! Due to their incredible fast metabolism (up to 1,260 beats per minute) hummingbirds must consume more than their own weight in food daily in order to survive the night when they cannot eat. The number of individual birds that visit the feeder varies depending on the season and in particular with the amount of plants that can be found flowering further up the mountain. Due to the high protein content of nectar that makes up the majority of a hummingbirds diet they always prefer the real thing to the low protein sugar water and therefore only come to the feeders to supplement their diet. This means that when there are more flowers in bloom there are fewer birds visiting the feeders, which is a good thing as humming birds are vital pollinators in the tropical forests. To make sure that they are not distracted from this important task by the presence of the feeders, Fundación Jocotoco, who owns and manages Buenaventura Reserve, has commissioned a study into how feeders affect the behavior of tropical birds. 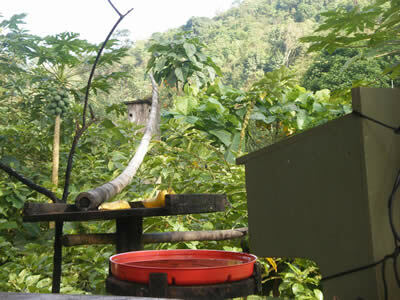 Apart from the main bird feeder we also have the coati feeding platform which is stocked daily with bananas to attract the mammals out of the forest. The coatis that some of you have come to know and love are all from the same “band” that live near the location of the camera and consists of 4 adults and 6 juveniles. Coati bands are made up of females and juveniles as adult males are extradited from the group and live alone only returning for the mating season. As you can see in the top picture, to help the coatis get to the platform we have put down a bamboo pole for them to walk across. 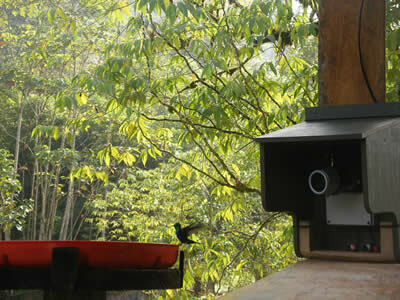 The cam and feeder are positioned on the side of a small house at the lower elevation part of the Buenaventura Reserve. The building is used by the park guards and the location gives us the dual advantage of access to electricity and internet as well as having the staff on hand for maintenance. The disadvantage — now that we have sound — is that some of you may have heard talking in addition to the jungle soundtrack. To ensure that we get more forest noises and less human interruption we have fitted a long extension chord to the microphone and we will shortly be locating it somewhere further in the forest to get an uninterrupted jungle soundscape to go with the webcam footage. We will be tweaking the system to get even better results so keep checking back and remember to tell your friends about the project –- it really is a world first! Buenaventura and other reserves supported by the World Land Trust provide a safe haven for some of the most unique and threatened species in the world. If you would like to help protect these areas in perpetuity you can make a donation to World Land Trust to protect threatened wildlife areas forever.